Having bought the 12" single of 'It's all in the game' and the 7" single of 'Haus der drei Sonnen', it's obvious that I still had to have the 7" single of the former and the 12" single of the latter. The mission continues, but half of it has been successful: I found the 12" single of 'Haus der drei Sonnen'. The 12" mix of this track is not different from the English version, but of course it is sung in German. The B-side is the same as the B-side of the 7" single. 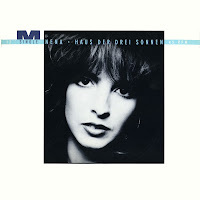 'Haus der drei Sonnen' ('House of three suns') was released as the third single from Nena's 1985 album 'Feuer und Flamme'. 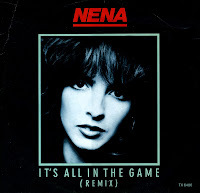 The song was released internationally as 'It's all in the game', but it wouldn't be a very big success for Nena. Just like this single, which only reached number 43 in Germany. I've been searching for this single for some time, so the actual find was a big pleasure. This single alone, to me, is worth the price of all the singles I bought in this shop on this day. 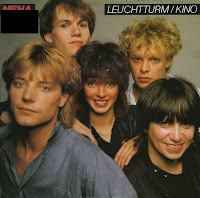 'Jung wie du' ('Young like you') was released in 1985 as the fourth and final single from Nena's 1984 album 'Feuer und Flamme' ('Fire and flames'). The single reached number 47 in the German singles chart, but failed to chart elsewhere in Europe. 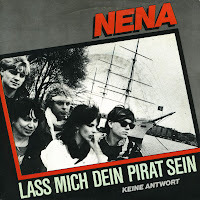 'Lass ich dein Pirat sein' is a beautiful ballad taken from Nena's 1984 album '?'. It was released as the third and last single from the album and became the least successful one, peaking at number 53 in the German singles chart only. It was played very often on Dutch radio. I recorded the track from the radio but was never able to buy the single at the time. In 1986, Nena released their sixth album 'Eisbrecher' ('Ice breaker'). It was to be their last album as a band; frontwoman Nena Kerner continued as a solo artist, still using the name Nena. The single 'Mondsong' was written by her and recorded with the band. 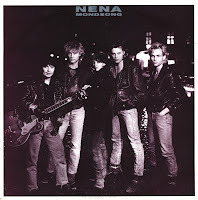 Although one more single was released from the album, 'Mondsong' ('Moon song') was the last hit single for Nena the band, peaking at number 37 in the German singles chart. 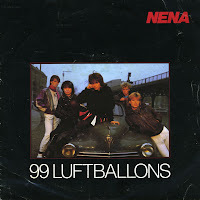 Having achieved widespread success in Europe and Japan with '99 Luftballons', Nena wanted to try their luck in the rest of the world with an English version of the song. Kevin McAlea wrote this version, titled '99 red balloons', which has a more satirical tone than the original. The English version is not a direct translation of the German but contains a somewhat different set of lyrics. 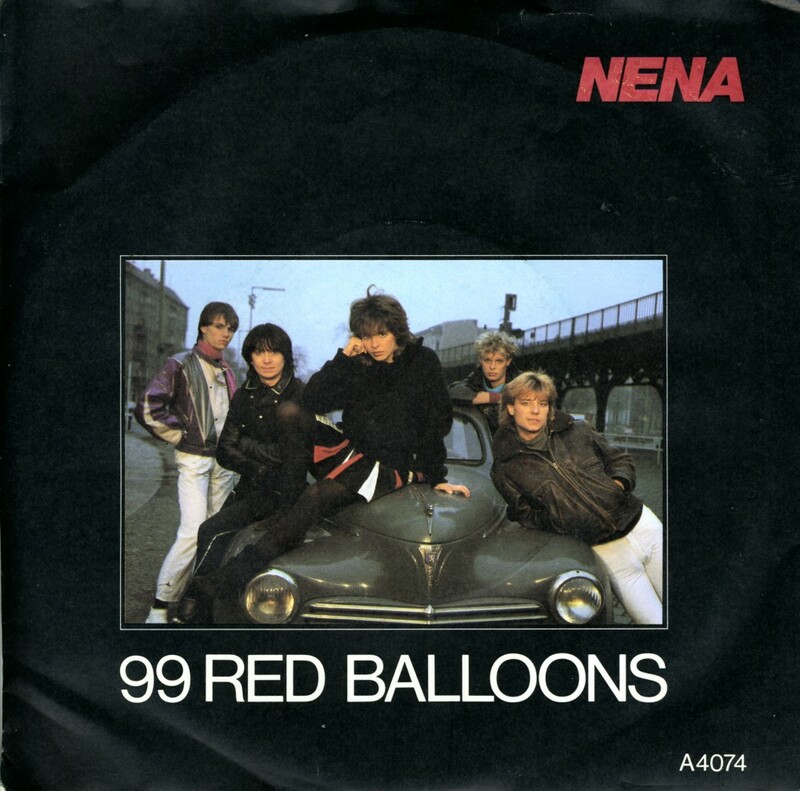 Nena recorded '99 red balloons' despite their dissatisfaction with the lyrics, which they expressed in numerous magazine interviews in 1984. They felt the English version was not a faithful rendition of the German original. Still, with this song they achieved something few other German bands had achieved at the time: a number one hit in the UK. It was not their debut single, but the biggest hit of Nena's career did come early on in their career. The lyric of the song was written by the band's guitarist Carlo Karges after he was at a Rolling Stones concert in Berlin. He noticed that balloons were being released. As he watched them move toward the horizon, he noticed them shifting and changing shapes, to the point of looking a lot like some UFO. He thought about what might happen if they floated over the Berlin Wall to the Soviet sector. The lyric speaks of an apocalyptic overreaction by military forces. 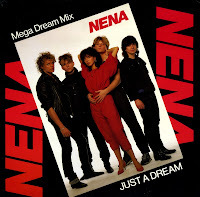 When the song was released as a single from Nena's debut album in early 1983, it was an immediate hit not only in German-speaking countries, but also in the Netherlands, where it topped the Dutch Top 40 for a few weeks. 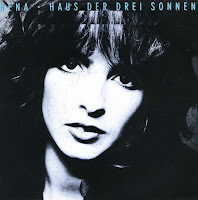 While Nena was becoming a household name in all of Europe with English versions of her earlier singles '99 Luftballons' and 'Nur geträumt' ('99 red balloons' and 'Just a dream' respectively), she also released a German single from her debut album 'Nena'. In July 1983, she reached the Dutch Top 40 with 'Leuchtturm', a beautiful pop song, which reached number 13. 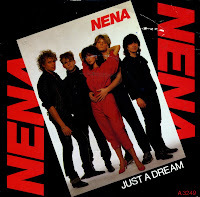 Not content with having a European hit with 'Nur geträumt', the German band Nena recorded the track in an English version entitled 'Just a dream'. This English version was the follow-up to '99 red balloons', the English version of her hit '99 Luftballons' which reached number 1 in the UK. 'Just a dream' did much worse in May 1984, reaching number 70 during a two week chart run. It was also the last Nena single to chart in the UK. 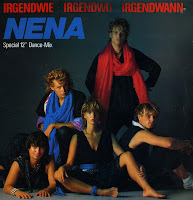 Nena released the original version of 'Irgendwie, irgendwo, irgendwann' in 1984. It was the first single from their 1985 album 'Feuer und Flamme', released a year later. After two previous singles failed to reach the German top 10, this one shot up to number 3, shuffling the band right back into the limelight again. This 12" single features an extended mix of the track. It would be translated into English by Lisa Dalbello as 'Anyplace, anywhere, anytime' that same year, recorded on the band's 1985 English album 'It's all in the game'. In 2003, Nena had a hit with that track when she re-recorded it with Kim Wilde. 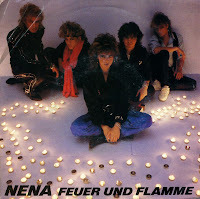 'Feuer und Flamme' was the title of Nena's fourth album, released in 1984. It was the first album of the band to be reproduced in English in its entirity. The English version 'It's all in the game' was released in 1985. The title track was released as a single, with the English version of the track, 'Woman on fire', on the B-side. I already wrote about 'Just a dream', but this is the original single. 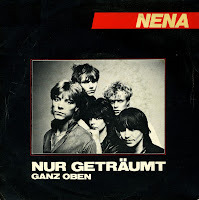 'Nur geträumt' was taken from Nena's self-titled debut album, and it was originally released as their debut single in Germany. It became an instant hit there after the band appeared on the German television show 'Musikladen'. The single reportedly sold 40,000 copies the day after the song appeared on the show and reached number two in the German charts. In the Netherlands, it was released after '99 Luftballons' had become a number one hit for them. 'Nur geträumt' did almost as well, peaking at number 9 in the Dutch Top 40. Sometimes when you're in a record shop, going through the racks, you get this 'what's this?'-experience. Finding this 12" single was such a moment. I was buying a few 12" singles and while I was browsing I saw this sleeve. It was an English version of Nena's hit 'Nur geträumt', and both the sleeve picture and the title of the record instantly drew my attention to it. I wanted to try it out, because the original German track was eighties pop at its best. Unfortunately, the 12" version of 'Just a dream' is a tad too experimental for my taste. A bunch of echo effects, lots of repetition and more drums than you can shake a stick at. After having had hits with '99 Luftballons', 'Nur geträumt' and 'Leuchtturm' in the Netherlands, '? 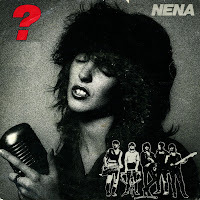 (Fragezeichen)' was the first single taken from Nena's second album of the same name. It was a good success, peaking at number 12 in the beginning of 1984. The b-side 'Ich lieb' dich' was sung by band member Carlo Kages. 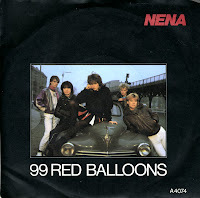 After her international success with '99 red balloons', German singer Nena tried to equal that success with later work. Her attempts were sympathetic, but not successful. Her first album 'Nena' was slightly successful in the UK, but the second English-language album 'It's all in the game' sunk without a trace.